Children’s art. Isn’t it glorious? Don’t you just love the sureness of it, the exuberance, the energy, the complete unselfconsciousness? The way nothing quite matches, and yet it all hangs together? So much glee – googly eyes, manic grins! Wonky windows! Anatomically implausible creatures! 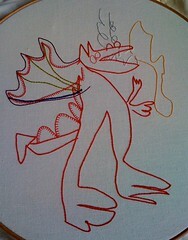 Long-time readers may just about remember the Oyster’s drawing of a dragon, which I stitched in 2009 as a gift for my parents. I knew I’d love the project, but I wasn’t prepared for how much it moved me. Something about honouring my son’s art as art? Following his confident pencil lines so precisely? Making a genuinely collaborative work of art with a five-year-old? But I wanted to do it again! 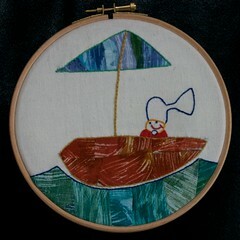 So I made the boatman, also drawn by the Oyster in 2009, using appliqué techniques as well as surface embroidery. And then when the Feaster, aged three, produced a magnificent portrait of my friend’s three daughters (the eyes have pupils! ), I went to town altogether. This was the first children’s art piece I made by machine. I quilted the Feaster’s pencil lines first, then added dense feathering and stippling to the background and made a foundation-pieced border. You know what? I’m not finished with this. It’s a commission service. The clue is in the name: You send me some child art that makes your heart sing, leap, melt – all that good stuff. I turn it into a unique textile piece, just for you. Your child’s first recognisable drawing of a face, chainstitched on a fabric bag. A favourite painting by your grandchild, made into a cushion cover as a gift to your grown-up child. A picture you did when you were eleven and never forgot, interpreted as an embroidered textile and framed. 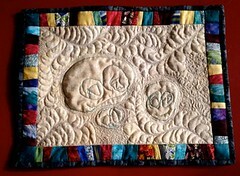 A painting your godchild or oddchild made for you, turned into a quilted wall hanging. What else can you imagine? Tell me – I’d love to give it a try. No matter what form it takes, your commission will be stitched with such love and care that you’ll feel an electric thrill when you handle it. * My technical and artistic skills have been developed over more than three decades, and this is meticulous, detailed work. I know that you’re going to get as big a kick out of receiving your piece as I will out of making it. * OK, not an actual electric thrill. That would probably breach health and safety regulations. But I promise you that your finished piece will positively thrum with joy. You pay a deposit (fully refundable until stitching begins), and e-mail me a digital photograph or scan of the artwork. We discuss design, colour scheme, materials, size, and finishing, and agree a final fee. As soon as the design is settled, you pay half of the remaining fee, and I start stitching. When the piece is finished, I send you photographs for your final approval. You pay me the balance due, and I ship your piece. Afterwards, I may write about the project on String Revolution and publish photographs of my work. Incidentally, I favour high-quality, sustainably produced materials – Irish linen, organic cotton, or silk fabric; cotton, silk, or wool threads; glass (not plastic) beads. Since this is a new service, I’m still working on pricing (a tricksy beast at the best of times). But I can tell you now that these are introductory numbers: as more of these child-inspired masterpieces go out into the world, and as my schedule fills up with commissions, the prices will rise. Each commission will be individually priced, according to size, complexity of techniques used, and finish. For a piece measuring up to 6″ in its maximum dimension, expect to pay between $350 and $500. For a piece measuring 6″-12″ in its maximum dimension, expect to pay between $450 and $700. For a piece measuring 12″-18″ in its maximum dimension, expect to pay between $650 and $900. To get started, click the PayPal button below and pay a deposit of $150. After you’ve paid your deposit, send your scan or digital photo to me (e-mail it as an attachment to leannich at string-revolution dot com), and I’ll respond with a quote for the finished work. If we decide not to work together after all, I will refund your deposit immediately. What sort of finishing options are there? There are all kinds of possibilities. The finished piece can be framed in an embroidery hoop or a standard picture-frame. I can add a hanging sleeve and dowel. The piece can be quilted and bound, or stretched and stapled to a wooden block. I can use the embroidery as part of a bag, a cushion cover, a piece of clothing. Tell me what you’d like – I can probably work out a way to do it. Can I buy several items with the same design? Can you stitch any child’s picture? Yes, I reckon so. As I look through the piles of art by the Oyster and the Feaster, the pieces that call out to me tend to have clear outlines and/or well defined shapes. But even in the absence of those, I’m confident that I can interpret in textile form any mark made by a child. Try me! What techniques will you be using? Whatever suits the piece. Surface hand-embroidery and appliqué will be the commonest techniques, I suspect, but I’ll also use machine embroidery, beading, couching, quilting, or anything else that strikes me as an enhancement of the work. If you have particular likes or dislikes, let me know. Not for the initial deposit, but for the rest of the fee, absolutely. Talk to me to agree a schedule of payments. How long will I have to wait for my own personal slice of the joy? I envisage completing two to three of these projects each month. So it really depends on the backlog, not to mention what’s going on in the rest of my life. If you’d like your piece to be ready in time for a particular occasion, talk to me, and I’ll see if I can fit it in. Feel free to contact me if I can give you any further information that might help with your decision. Here’s that PayPal button again. As soon as you’ve paid your deposit, simply e-mail me some child artwork that thrills you to your toes, and we’ll take it from there.